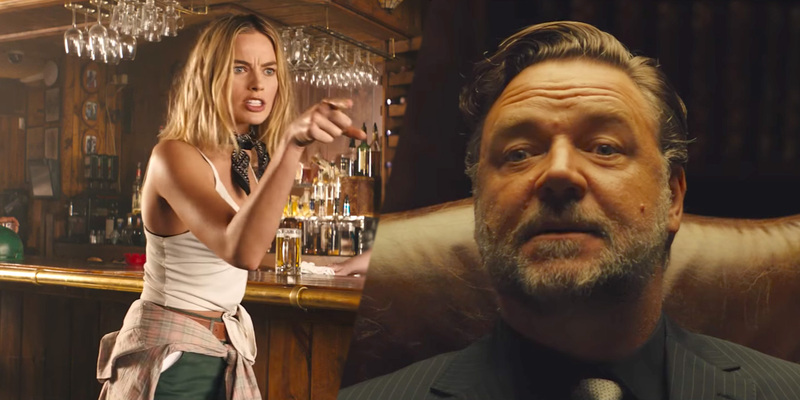 A full-length trailer for Danny McBride's Crocodile Dundee sequel Dundee: The Son of a Legend Returns Home has arrived, and it features appearances from several famous actors, including Margot Robbie and Russell Crowe. It's been a little over a week since we first got wind of the supposed follow-up to Paul Hogan's old film series via a teaser trailer. That confusing first glimpse featured McBride delivering a pretty cringeworthy rendition of the original film's infamous "That's not a knife" quote. The teaser prompted a ton of questions, ranging from "how are we just hearing about this?" to "so is this supposed to be a comedy or...?" The headscratching continued with the release of subsequent movie footage, which confirmed the involvement of major Hollywood stars like Chris Hemsworth and Hugh Jackman. The increased star power in those clips hasn't managed to drum up much in the way of laughs, but thankfully, a recent scoop from the Brisbane Times seemingly revealed the project to be an advertising campaign for Tourism Austrailia. Despite being outed as a fake movie, the viral marketing campaign marches on today with the reveal of a brand new, full-length trailer. Eyebrows were raised when Hemsworth and Jackman got involved, but the full trailer is absolutely jam-packed with famous native Australians. A-list stars Margot Robbie and Russell Crowe are the obvious highlights, but they're definitely not the only famous faces on display. Check the trailer out for yourself in the player above! Isla Fisher, Ruby Rose, and Luke Bracey all make appearances, as does Chris Hemsworth's little brother Liam (who comes pretty close to delivering a chuckle-worthy moment). Australian R&B singer Jessica Mauboy gets a chance to show off her chops as well. There's no apparent plot to be found in the two minute clip, but since this is all just a viral marketing campaign advocating for more people to take a vacation to the land down under, we suppose it doesn't really need one. A laugh or two would've been nice, though. The campaign is apparently set to culminate on Super Bowl Sunday, which leaves plenty of time for more famous Aussies to film a short clip and get in on the act. Big names like Cate Blanchett, Nicole Kidman, and Joel Edgerton could all lie ahead, as could folks like Eric Bana, Jai Courtney, Guy Pierce... Man, Australia really does produce a ton of Hollywood stars, doesn't it?